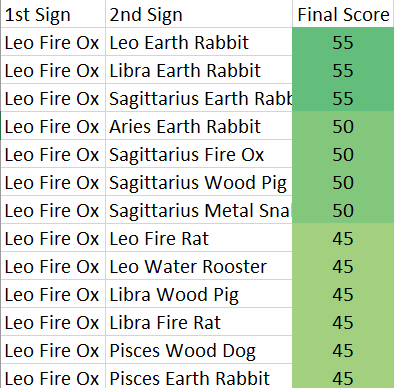 What are Leo Fire Ox personality traits? Leo Fire Ox are generous. They are not hesitant to give more than others. They have a strong sense of loyalty so don’t worry about them stabbing you in the back, in fact, they will probably save you from one. LFOs are dynamic, which means they are prone to growth and progression. These people usually don’t have a problem when it comes to dealing with difficult situations or moving up in their careers. They also bring warmth to people around them. They have a strong sense of kindness which makes it hard for people to move away from them. The Leo Fire Ox is one of the calmest people. No matter how crazy situations can get, these people won’t panic as much and will be able to put things back in order. They are dependable, if you need a friend, they’ll be there for you. On the other hand, the Leo Fire Oxes have a tendency to dominate people. They may ignore other people’s feelings and force their way through to obtain what they desire. Their arrogance will make them think highly of themselves which can sometimes hurt others around them. The LFO is an aggressive character. They will push people aside to obtain what they want. If they feel that their precious time is being wasted, they will become impatient and will take things into their own hands without caring about other people’s opinions. The Leo Fire Ox is one of the most stubborn people. If you want them to convince them that they’re wrong, a lot of time may be wasted. They are also biased and are not able to think fairly or reasonably sometimes. 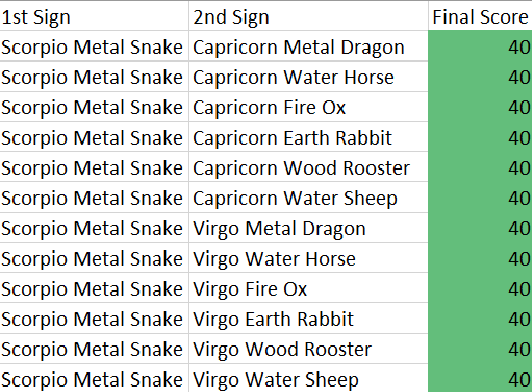 What are Scorpio Metal Snake personality traits? The Scorpio Metal Snake sign is one of the most determined people that you will find. If they are set on something, nothing is going to stop them from getting it. They have a passionate heart so they put their 110% in everything that they take interest in. SMS are self-reliant and won’t need much dependence on others. When they come into trouble, they are able to figure it out. They are orderly so expect their surrounding to be organized and the way they carry themselves. The Scorpio Metal Snake is a graceful animal. The way they talk and move shows that they are elegant. They are very wise which shows that they can absorb experiences quickly and have a great sense of judgment. On the other hand, the Scorpio Metal Snake can become a jealous creature. They want control of their materials and their loved ones, so stay true to them or they will sting you back. They can become obsessive when they have a strong interest in things or people. The SMS can become an unyielding person. If you wrong them in any way, guess who’s going to have to be the first one to apologize. Many times, they can become impulsive and will do and act on their feelings more than using logic. Worst of all, Scorpio Metal Snake can be one of the most malicious animals. They sometimes don’t mind using evil ways to achieve what they want without caring for people’s interest. The snake is also possessive in which they will hold on to things and people even if it is not in best interest for anyone. What are Cancer Water Monkey personality traits? A person born under the sign of Cancer Water Monkey is very caring. If you come across one, they will stand out for their undying love for their loved ones. They may seem to be an open and caring person, but when it comes to serious matters, they will show their cautious nature. CWMs are very flexible. They flow like water, no matter if there are drastic changes, they will flow along while everyone is fighting the current. Similar to a peaceful lake, the water is a still and can be calm even when a storm is present. Cancer Water Monkeys are quick-witted. They are usually the first ones to think of a solution to a problem. The monkey is also persuasive. If they have their eyes on something that they want, they will know how to use words and action to make it come to them. On the other hand, Cancer Water Monkeys can become moody which makes them overbearing for other people. They can be clingy which makes it difficult for them to let negative things go and move forward with their lives. The CWM can be a lazy. They are less likely to be proactive and will wait until someone pushes them to do something. Because of their laziness, one can see why they are passive as well. If there’s a conflict around them, don’t expect them to get involved. The Cancer Water Monkey can be egotistical. They are a selfish creature which they will push other people aside to make sure they are at the center of attention. The monkeys are known to be disrespectful which they will use any method to obtain their own needs and desires without caring for other people. 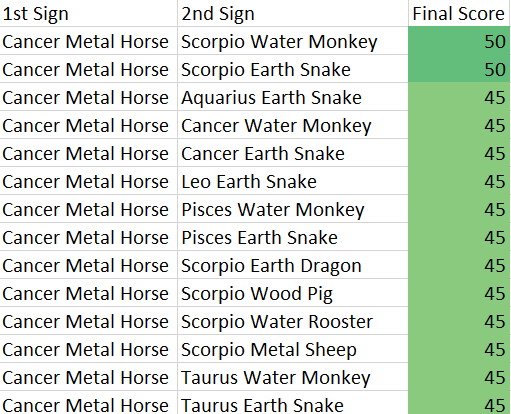 What are Cancer Metal Horse personality traits? A person born under the sign of Cancer Metal Horse is very caring. If you come across one, they will surely make themselves stand out by their undying love for their loved ones. They may seem to be an open and caring person, but when it comes to serious matters, they will show their cautious nature. The CMH is a determined character and will be able to see straight to their goal. Making sure nothing gets in their way because all they see is reaching that finish line. They are also self-reliant and will be fine by themselves. When they come into trouble, they are able to find their way out. 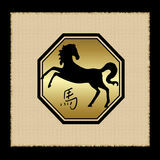 The Cancer Metal Horse is a cheerful animal and will make the surrounding positive when they are present. They are also very popular so social skills is one of their strong points. On the other hand, Cancer Metal Horses can become moody which makes them overbearing for people to be around with. They can be clingy which makes it difficult for them to let negative things go and move on with their lives. CMH can become an unyielding person. If you wrong them in any way, guess who’s going to have to be the first one to apologize. Many times, they are impulsive and will do and act on their feelings more than using logical thinking. The Cancer Metal Horse can be stubborn and will not yield to anyone’s opinion sometimes. They can also become very talkative to the point which it can be annoying to listen to. 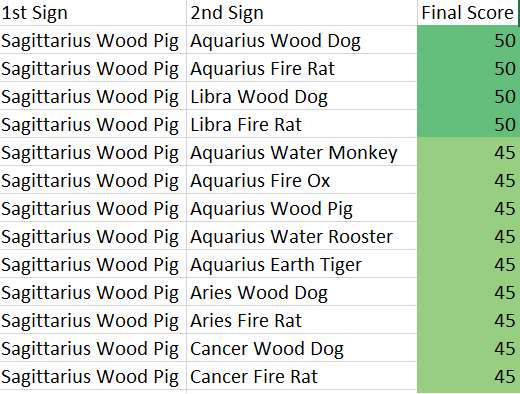 What are Sagittarius Wood Pig personality traits? The Sagittarius Wood Pig is one of the most optimistic signs. No matter how bad the situation can get, they will still see things half full. They are adventurous creatures so they need some excitement in their lives to keep them happy. The SWP is a generous person, they will give more than they take even if it does not benefit themselves. They are constantly growing and they will continue to seek out knowledge and skills to help improve themselves. Sagittarius Wood Pigs are known to be sturdy so it’s great to have them on your side when things are tough. They are popular creatures so expect a crowd of people usually around them. On the other hand, the Sagittarius Wood Pig can become careless. They may tend to take more risks and ignore the consequences that come along with it. If they become bored, one can see their restless behavior and will become difficult to be around. The SWP person can be easily overburdened because they tend to take on more than they can handle. Wood people can also be very passive and not care about critical situations. the pigs can be materialistic to the point where they will put their own selfish desires ahead of everything else. The Sagittarius Wood Pig is pigheaded and sometimes they refuse to listen to others’ opinions especially when it’s something that they strongly believe in. 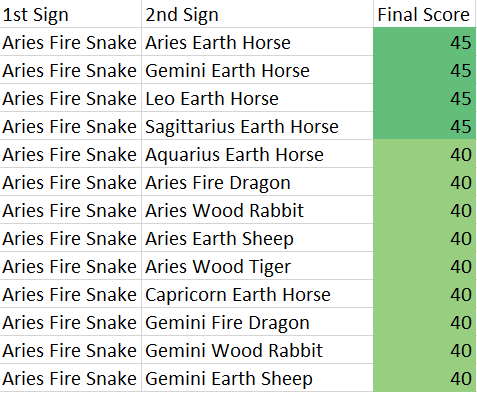 What are Aries Fire Snake personality traits? Aries Fire Snakes are courageous which can tend to make them great leaders. When life gets tough, they don’t give up easily. They are adventurous so they will not hesitate to take risks and try new things. AFS are dynamic, which means they are prone to growth and progression. They usually don’t have a problem in dealing with difficult situations or moving up in their careers. They also bring warmth to people around them because they have a kind heart. The Aries Fire Snake is a graceful animal. They talk and move with elegance. They are very wise which shows that they can absorb knowledge quickly and have a great sense of judgment. On the other hand, Aries Fire Snakes can become impatient towards others. Too often they take action without thinking first due to their impulsiveness. The AFS can be aggressive. They will push people aside to obtain what they want. If they feel that their precious time is wasted, they will become impatient and will take things into their own hands without caring about other people’s feelings. They can be selfish and tend to think for themselves. Aries Fire Snakes can be malicious. They sometimes use unethical methods to achieve what they want without caring for people’s interest. They can be possessive in which they will hold on to things and people even if it is not in anyone’s best interest. 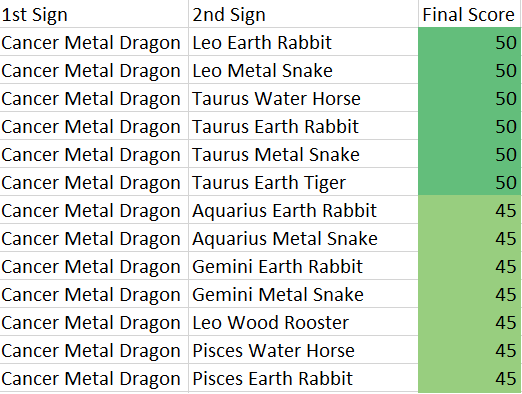 What are Cancer Metal Dragon personality traits? A person born under the sign of Cancer Metal Dragon sign is very caring. If you come across one, they will surely make themselves stand out through their love for people that they love. They may seem to be an open and caring person, but when it comes to serious matters, they will show their cautious nature. The CMD is a determined character and will be able to see straight to their goal. Making sure nothing gets in their way because all they see is reaching that finish line. They are also self-reliant and will do just fine on their own. Cancer Metal Dragons are one of the most ambitious signs, they will do whatever it takes to achieve their goals. They are also one of the most energetic signs making them difficult to not notice their presence. On the other hand, Cancer Metal Dragons can become moody which makes them overbearing for people to associate with. They can be clingy, making it difficult for them to let negative things go and move forward with their lives. The CMD can become an unyielding person. If you wrong them in any way, guess who’s going to have to be the first one to apologize. They can be impulsive and will act on their feelings more than using logical thinking.